How Jackets are turning Indian fashion styles in a big way? There is no better way to showcase your personality then in Indian wear in the surroundings and festive vibes of Indian culture. Indian traditional dress ups are the best suited for all the occasion and choices irrespective of your presence and surroundings. They are ideally suited for all the places, whether, they are any party or it is in your office surroundings. Styled, appropriately, Indian dress ups give a formal looks depending upon how you dress up yourself into them. Among the trends of Indian fashion, the, short jackets are getting vastly popularized among Indian youth. Though there are many ways to accessorize the wardrobe with, there are short jackets which are immensely popular among stylish divas these days. Despite all out preferences with varying fashion style, yet, we prefer Indian symbols for the occasions as attending Indian weddings as well. 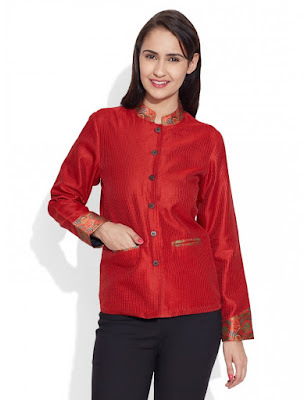 Short Jackets look fabulous on kurti, lehenga, saree and other simpler appearing dresses as well too. There are the following ways and style to get Indian dresses to be stylized and impacted over in long run design and workability. • Short jackets are immensely popular among the college goers especially the one that are designed and impacted with beautiful embroidered and printed jackets. What a jacket offers is an opportunity to get rid of first of all from duppta and sophisticated dressed up appeal. It develops and appeal and complements the Indian attire in very great way and unique looks. • Jackets are even great to be worn upon the Sarees as well. Wearing a full sleeved short jacket over sarees even appears to be great and unique in style. By the creative looks they just turn them into a true fashion statement. Next printed jackets could even be worn in a stylish way to get coordinated looks. They offer a great unique and extraordinary looks as they are easy and savvy and extraordinary from the rest of the world. • Whereas with the long embellished jackets they look out to be very different and unique and offers a royal appearance to one’s look. A long jacket with embellished cuffs and mandarin collars presents your saree a stylish makeover and raze. For a better jacket and saree combination you can have imitations inspired from your favorite bollywood actress. There are plenty of designs and patterns are available to wear short jackets for women in different ways and style in extraordinary style and methods.